This beautiful embellished black maxi dress is perfect for any formal event--it can also be dressed down with beaded sandals and a gold boho headband. The Gold Plated Embellished Maxi Dress is fully lined to the mid-thigh. It is made entirely of chiffon. 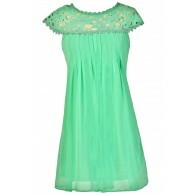 It has wide shoulder straps and a plunging neckline with a deep V in the front. The empire waist gives way to the flowy full length maxi skirt. 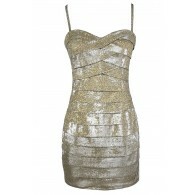 The best part of this dress has to be the gold and bronze sequin, stud, and embroidered design at the bodice. We think it has a gladiator inspired feel to it! A hidden back zipper completes this dress. The Gold Plated Embellished Maxi Dress would make a cute prom dress. Pair it with strappy metallic heels and a clutch or dress it down with a gold headband. Comes in 3 color options. Details: Lined to the mid-thigh. Hidden back zipper. 100% polyester. Lining: 100% polyester. Dry clean only. Small measurements: Length from top of shoulder to hemline: 60". Bust: 32". You have added Gold Plated Embellished Black Maxi Dress into Wishlist. You have added Gold Plated Embellished Black Maxi Dress for Stock Notification. You have set Gold Plated Embellished Black Maxi Dress as a loved product. You have removed Gold Plated Embellished Black Maxi Dress as a loved product.